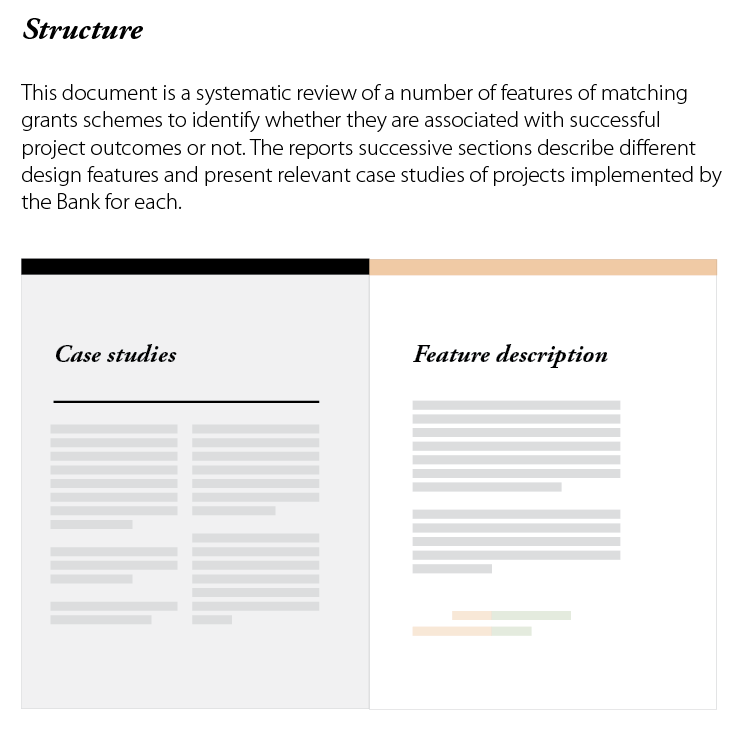 The World Bank has been using a financial instrument called a "matching grant" for around 20 years and this is the first systematic review of their experience. The goal is to inform the World Bank teams considering this instrument on the past experience of their colleagues and to guide their choices of features in their own projects. Given that this is both a study and a reference document, we chose a design inspired by highlighters. We want to convey that the authors have researched tens of reports to synthesize the findings for the reader. More importantly, we wanted to invite the reader to own this document. They should feel free to annotate the document, to underline interesting sections, to dog-ear some pages. We started doing it for them. The highlighting was done manually across the entire report to suggest a handwritten feel. This means that, while the use of colours is consistent, each page is unique. With the authors, we considered highlighting key sentences in the text, but the idea was later set aside by management. Each chapter uses a different colour for its header, with some repeating once. The table of content reflects this attribution of colours, again to guide the reader who will flip through the document for a particular information. Given that the highlighter theme is colourful and unique, we chose minimalist layout and typography, with Myriad and Adobe Garamond fonts. Both were used out of character though, with the serif font used for titles and the sanserif font for the body of the text. The heart of the report, chapter 4, is structured around the features under review. Each feature has a description, a quantitative study and a case study. We did two things to help the reader understand this structure. First, we used a consistent design with the case studies on the left and the description and graph to the right. Even for the few features that did not have a case study, we kept the left page blank, rather than changing the rhythm of the spreads. The second things that we did is to present the structure to the reader in the table of content. We wrote out a short explanation and we added a sketch representing the look of the spreads. This will help the readers flip through the report to find the feature they are looking for, looking at the data, perhaps reading the case study to understand a real-life example. For every feature of matching grants, the authors measured whether its inclusion lead to a higher likelihood of project success. Projects rated highly satisfactory, satisfactory and moderately satisfactory are considered successful under this scale. The authors had collected the data in tables, highlighting (in red) the combined percentage of projects that were successful. The colours are intuitive, with green for successful projects and orange for unsuccessful projects. They are also colorblind-friendly, which would not have been the case had we used red for unsuccessful projects. The scale remains constant across all features, going to 100% on each side. This way, the reader can get used to the layout of the graphs and see at first glance how they are balanced, left of right. Where the data allowed it, we always put Yes (feature included) at the top, followed by No (feature excluded) and all projects at the bottom, separated by an horizontal line. This is another convention that the reader has to understand only once before navigating all the similar charts. The legend is compact with underlines rather than markers for colours. It is also aligned on each side of the divide between successful and unsuccessful projects. In the methodology section, the authors present the distribution across regions of projects using matching grants. These projects are not distributed identically to all projects in the whole unit where these projects took place (FPD: Finance and Private sector Development). The authors had used two pie charts, given that they were presenting two distributions. The problem is that it made it difficult to compare the differences between the distributions. Our solution was to overlay bar charts representing the distribution of matching grants over a histogram representing the distribution of all FPD projects. In this graph combining the two datasets, it is easy to see which regions are over- or under-represented. Using this format also allowed us to avoid acronyms and a footnote. This report shows that design of data visualizations, but also report layout have to be deliberate and tied to the purpose of the report, to help it achieve its goals.